Tray icon is the only GUI. Users mostly uses the Windows file explorer, but also programs such as MS Word that open and save directly from/to the local synchronized folder. Whenever files are added to a given local folder, my app uploads them. But now for a particular customer I have a new requirement: For each file to upload, first require the user to enter a description string. No file can be uploaded without a description (the server enforces this). What would the most simple, user-friendly and efficient UI be for this? Note the absence of a "Cancel" button. Indeed, my app keeps files in sync, so the only alternative to entering a description and uploading the file would be to delete the file. Users expect to enter a description for each file, so they probably will refrain from dropping 10000 files in one drop, but they might still do it by mistake. In that case I would suggest them to close my app and delete the mistaken files manually before restarting my app. Let's say the user dropped 3 files, I wonder whether it is OK to show the popup 3 times in a row with just a different popup header, or whether the standard way to go in such cases is a more complex GUI with a kind of tasks queue, or something else entirely? After a file drop, it'd be useful to display a replication of the file structure the user just added, along with the description fields that need to be completed. This way, if there are multiple files with the same name, the user can distinguish them from each other. It would be nice to be able to see where the files are uploading, with the ability to change the destination if a mistake was made. 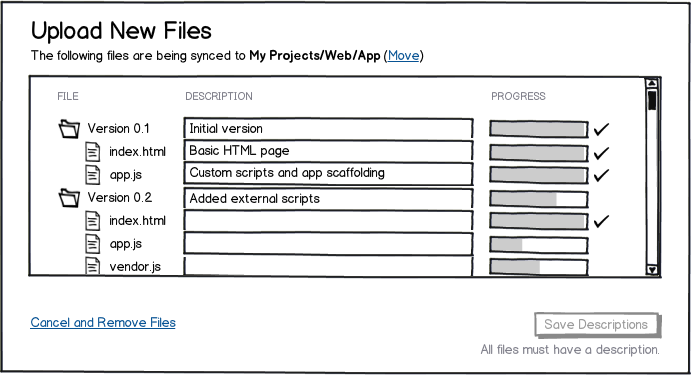 Ideally, you would be able to initiate the uploading of files as soon as the user drops them in the folder. If the user does want to upload 100+ files at once, adding descriptions to each of them will be inevitably tedious and time-consuming. Might as well use this time to upload the files as well. Since these descriptions are required, the only other action is to cancel and remove the files that have already been synced (if they had been eagerly uploaded). Once the user inputs all required descriptions, this upload modal should be dismissible, but reassure the user that the files will continue uploading in the background. Not the answer you're looking for? Browse other questions tagged input-fields desktop-application popup windows-os files or ask your own question. Should archived files (.zip, .gz, .7z, etc) have a subdirectory with the same name or not?